Good looking approx. 2200 sq. 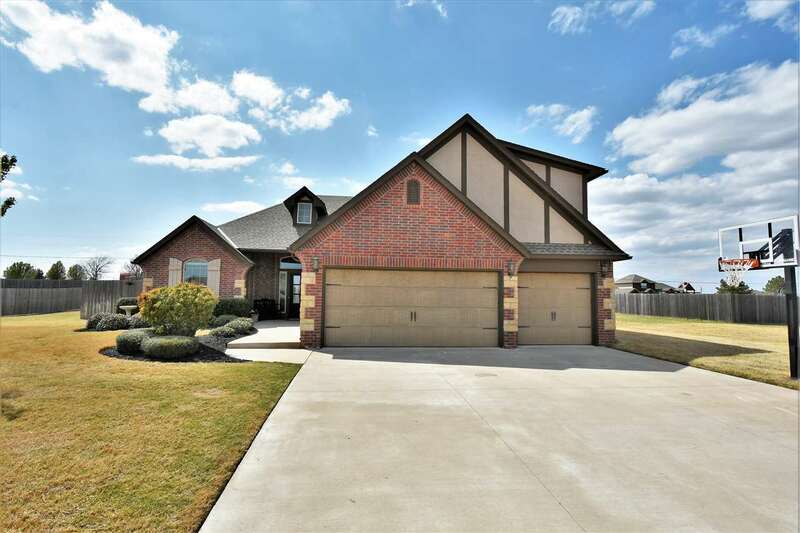 ft. open floor plan with 4 or 5 bedrooms, 2 1/2 baths with 3 car garage on 3/4 acre lot located in desirable Legacy Park which is Elgin&apos;s only neighborhood with concrete streets. Nice wood flooring in the entry and living area. Living area has cathedral ceiling with wood beam. Natural gas log fireplace, range, hot water heater, and heat for energy savings. Eat-in kitchen has custom built knotty alder cabinetry, tiled flooring, granite, breakfast bar, stainless appliances, and large pantry. Downstairs are 3 bedrooms and guest bath plus master bedroom and bath. Utility room has granite countertops for folding area plus storage. Upstairs is a bonus room or 5th bedroom. This room has a 1/2 bath and over-sized walk-in closet plus wired for surround sound, and TV hookup. Updates to home include - new carpet downstairs, fresh paint, updated lighting, and new deck off the covered patio. Backyard is privacy fenced with a wood-burning fireplace on the patio. Yard and landscape is established and there is a sprinkler system for the yard and flower beds. This home also has a storm cellar in the garage floor, blinds, and security system. The agreement has been maintained on the septic system and the yard has been treated for weeds regularly as well as pest control for the home.